C-reactive protein is a compound found in higher concentrations in the blood when there is inflammation occurring somewhere in the body. Gout, a condition characterized by pain and inflammation in the joints, can often be partially diagnosed by testing the C-reactive protein level. However, this test is more accurate in identifying gout when it is performed along with other tests more specific to the causes of gout. An elevated C-reactive protein level may indicate a number of other problems, as there is no way to determine where the inflammation it signals is located. C-reactive protein is synthesized in the liver and released into the bloodstream when any condition causing inflammation, including infection, is present in the body. High amounts of the protein in your body can indicate the onset of a variety of conditions, though it is not helpful in specifically diagnosing those problems since the compound's presence indicates inflammation only. Monitoring C-reactive protein levels is also helpful as a gauge for physicians to see if medications used to lower inflammation in patients with conditions like rheumatoid arthritis, gout and lupus are effective. Doctors can determine your level of C-reactive protein by taking a small blood sample, then mixing the blood with an antiserum that binds to the specific protein. Gout is a condition that resembles arthritis. It is caused when uric acid, produced by the breakdown of purine compounds, forms crystals around joints and joint tissue, resulting in swelling, inflammation and extreme joint pain. Testing C-reactive protein levels may be helpful in detecting the presence of gout, but, alone, it is not a definitive method of diagnosis for this or any other inflammation-causing disorder since, according to Medline Plus, some people experiencing inflammation do not have corresponding increases in their C-reactive protein concentrations. A study published in the March 2011 "International Journal of Clinical Pharmacology and Therapeutics" found that men who had gout and high levels of uric acid in their blood did not necessarily also have high levels of C-reactive protein. These results support the idea that C-reactive protein may not be a good test for gout diagnosis. MayoClinic.com reports, however, that it can also be tricky using a uric acid level test alone to detect gout as some people can have high uric acid concentrations in their body without developing gout while others who suffer from gout don't have unusually high uric acid levels. Additionally, a 2010 study focusing on the reaction of uric acid and C-reactive protein to certain kidney disease drugs indicates the two compounds may be connected in ways that scientists still don't fully understand. This was published in the June 2010 "Clinical Journal of the American Society of Nephrology." 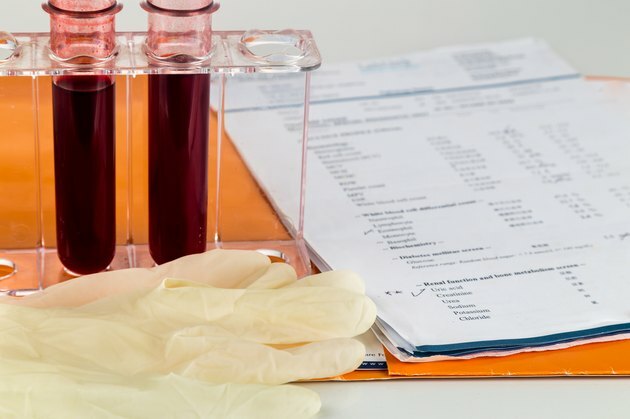 An elevated C-reactive protein level can be a warning sign for many conditions other than gout, including connective tissue disease, cancer, inflammatory bowel disease, tuberculosis, rheumatic fever and pneumoccocal pneumonia. The American Heart Association reports that high C-reactive protein levels -- more than 1.0 mg/L and especially more than 3.0 mg/L -- may be a strong indicator for a high risk of cardiovascular disease and heart attack. Are Lemon Juice and Baking Soda Helpful for Gout?